We want and need Sussex back at Horsham as a permanent fixture - that is the message from local batsman Chris Nash. The former Tanbridge House School pupil brought the county back to Cricketfield Road last week as part of his testimonial year celebrations, but it’s clear Nash, Horsham Cricket Club and all those involved want to make the visit a permanent one once again. Sussex played two T20 games on Wednesday against a Nash Invitational XI which saw upwards of 1,000 people through the gates during the day-long event. 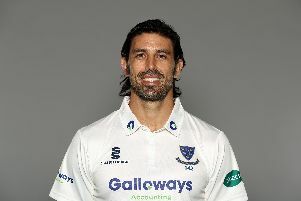 The day was organised as part of the Sussex opening batsman’s landmark year at Hove and also doubled up as a warm-up to their upcoming T20 Blast campaign which kicks-off in July. Nash was keen to bring cricket back to a place where he grew up playing the game after Sussex called time on their annual Festival of Cricket in the town in 2015. Lack of sponsorship from businesses meant that the county felt the week had become financially unviable and last year was only the second time in 34 years that Sussex did not play at Horsham. Last week the club put on a superb show of cricket, fun and food on a glorious day. There was the stellar show of the main event, music, corporate hospitality, the famous cake tent and much more, as the day went with a bang. All those in attendance called on Sussex to rethink bringing the fixture back to the ground; including corporate host Roger Dakin and former Sussex captain John Barclay, who both lauded the ground and setting. But the words of the star of the day summed it up. Nash said: “It’s glaringly obvious that we need it back here and we want it back here, days like this have proved that. “The powers that be from Sussex were here and if they could take one thing away, it is that we want it and we are prepared to work for it. “It’s been a great opportunity for us to showcase what we can do here, the people have been fantastic, the wicket is great and the boys love playing here, so fingers crossed we can get a good result. “When you first float the idea, you think hopefully a couple of hundred people turn up and we are pushing 1,000 here and that rose in the evening when people finished work and school. Sussex won both the games, Luke Wright stole the show in the first with a ton after Nash had fallen for a duck. They chased down 143 with eight wickets and almost seven overs in hand. Nash made 15 runs in the second match with Ben Brown hitting 72 and Delray Rawlins making 42 in their 187-6. Phil Salt (51) guesting for the Invitational XI led the way in their reply, but they came up well short as Nash also grabbed a wicket when bowling in the final over. Sussex: Archer, Barton, Beer, Briggs, Brown, Burgess, Finch, Nash, Rawlins, Salt, Van Zyl, Wells, Wiese, Wright. Nash Invitational XI: Abrahams, Alexander, Barr, Delmont, Edwards, Ekstrom, Gaylor, Jones, Jordan, Ludlow, Munday, Raval.